Much of the mountainous terrain between Trinity, Shasta and Whiskeytown Lakes is taken up by the Chippie Shasta OHV area managed jointly by the BLM and USFS. These hills do not rise much above 5,000ft and are sort of the poor cousins to the much higher Trinity Alps. There are three CC-listed summits in this area along with several P1Ks which I was interested in. I had spent the night at 3,500ft in the center of this region without another soul around for miles. That would change with the weekend influx of OHV enthusiasts, but as I awoke, breakfasted and got started before 7a, all was quiet. This is the highest summit in the region with more than 1,400ft of prominence. It lies outside the OHV area to the north, part of a patchwork of USFS and private lands. Ownership of the private sections is unclear and there were not the usual No Trespassing signs and fences that someone who cares about such things would install. Though I had a mountain bike with me, I would not use it on this first excursion of the day as the trails/roads are extremely steep, essentially running down one ridgeline and up another. Schell Mtn is roughly 5mi north of where I parked and on the OHV map my route is marked as trail number 35, Most Difficult. It was easy to see why. Even on foot it was a tough affair. In descending 400ft down the loose dirt route in short order I managed to slip several times. After reaching the saddle, a 750-foot climb up the other side follows immediately. After half an hour I had completed the Most Difficult section to reach Pt. 1,222m where the route becomes more moderate and consequently more enjoyable. A sign atop this point indicates the ridge dividing the Clear Creek and Sacramento River drainages was once part of an old pack trail used to supply the many mines that once dotted the landscape. I spent the next hour continuing north along the undulating ridgeline to the summit of Wild Cow Mountain. Open views along the way take in Shasta Lake to the east and the Trinity Alps to the west. The summits around Whiskeytown Lake can be seen to the south as I climbed above 4,500ft. 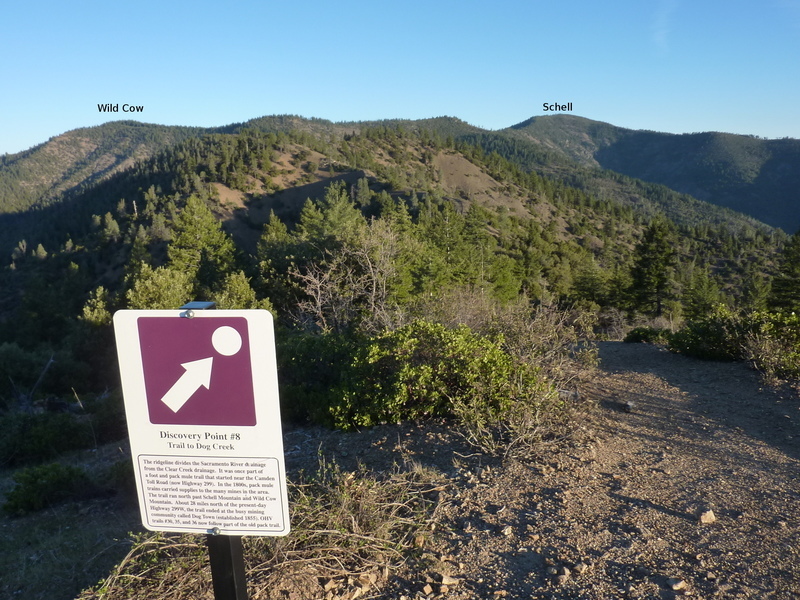 Though Wild Cow is the second-highest summit in the area, it is just an easy bonus peak on the way to Schell, no more than a half mile diversion to the west to reach the highpoint almost completely devoid of views due to trees and brush. After returning to the junction of trails 35 & 36, I turned left and continued north towards Schell. At the east end of Wild Cow Mtn the trail drops to a saddle and mostly ends here. I say "mostly" because at least one motorcyclist has attempted to forge a trail further north along the ridgeline through forest and over rock. How they kept from clotheslining themselves says a bit about their motorcraft skills or lack of critical thinking, I'm not sure which. Shortly, even the rudimentary trail ends and a mile-long stretch of cross-country travel ensues. Some of this involved a share of rocky scrambling, but mostly just a lot of dodging trees. At one time a firebreak had been cut along the length of the ridge but it has been more than a decade since, perhaps twice that. On the last section climbing up to Schell the firebreak becomes more open with evidence of OHV travel coming in from the north. It was 9:40a by the time I reached the summit of Schell with views open in all directions. Mt. Shasta to the north, Shasta Lake to the east, west to the Trinity Alps and south to Bohemotash and the Chappie Shasta OHV area I had started in. Three miles further north is Dog Creek Mtn, another CC summit, but I wouldn't be continuing in that direction - Dog Creek Mtn can be more easily reached from the north and I would save that for another day. It would take another two hours to return to where I started, largely along the same route. OHVs, mostly motorcycles, could be heard to the west and south periodically, but it was only on the last mile of the return that I crossed paths with several of them. I stood aside, watching a few of them tackle the steep, loose slope rising up to Pt. 1,222m. It was obvious that there was a great deal of skill involved in climbing such routes - I have no doubt I'd have dropped the bike a dozen times and been left wallowing in a puddle of tears had I been tasked to try it.